Quality is a slippery, complex, and sometimes abstract concept ... Philosophers have spent a great deal of time dealing with the concept of quality. 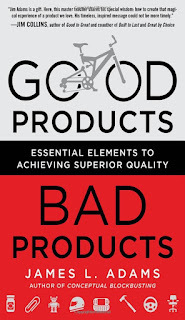 This is not a book on semantics or philosophy, so for our purposes we will simply assume that quality means "good." But, of course, that leaves us with "good for whom?" "good for what?" "good when?" "good where?" and if you really like to pick nits, "what do you mean by good?" I won't go there, either. characteristics of good products, such as elegance, and the emotions involved with outstanding products, namely love, are not easily described by [words, maths, experiment and quantification] - you can't put a number on elegance or love. Further, he's clearly thought long and hard about the topic, and I'd be surprised if he hasn't wrestled at length with definitions of quality - having spent no little time exploring my own definition of testing, I have sympathy for anyone trying to define anything they know and care about - before deciding to pursue this line. 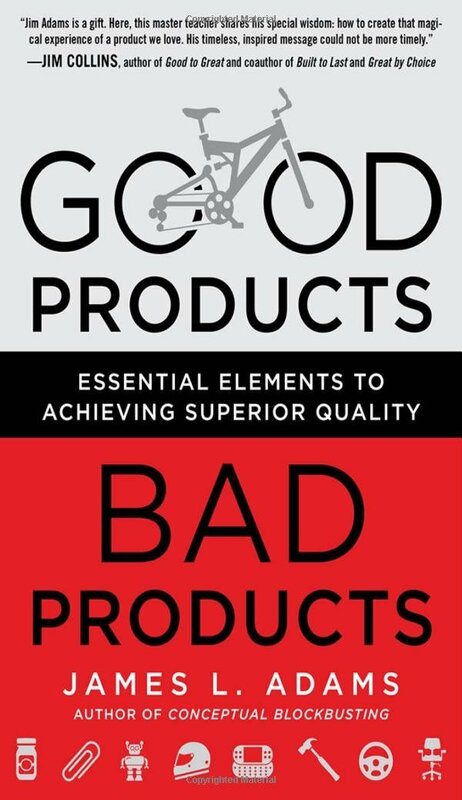 What's reassuring to see is that Adams is clear that whatever quality or goodness of a product is, it's relative to people, task, time and place. He references David Garvin's Competing on the Eight Dimensions of Quality, which I don't recall coming across before, and which includes two dimensions that I found particularly interesting: serviceability (the extent to which you can fix a product when it breaks, and the timeliness with which that takes place) and perceived quality (which is to do with branding, reputation, context and so on). ... we hypothesized that cutlery of better quality could have an influence on the perceived quality of the food consumed with it. Understanding the factors that determine the influence of the cutlery could be of great interest to designers, chefs, and the general public alike. Adams also provides a set of human factors that he deems important in relation to quality: physical fit, sensory fit, cognitive fit, safety and health, and complexity. He correctly, in my opinion, notes that complexity is a factor that influences the others, and deems it worthy of separation. And value is a measure of the amount that the person would pay for the product. Consider I'm eating a meal at a restaurant: if my enjoyment of the food is enhanced by heavier cutlery, but the cost to me remains the same as with lighter cutlery, then in some real sense the value of the food to me is higher and so I can consider the food to be of higher quality. The context can affect the product. the definition of "quality" is always political and emotional, because it always involves a series of decisions about whose opinions count, and how much they count relative to one another. Of course, much of the time these political/emotional decisions – like all important political/emotional decisions – are hidden from public view. Thanks to computers and research it seems to me that we have gotten better at purely technical problem solving but not necessarily at how to make products that increase the quality of people's lives - a situation that has attracted more and more of my interest. And so there's another dimension to consider: even a low quality item (by some measure, such as how well it is built) can improve a person's quality of life. I buy some things from the pound shop, knowing that they won't last, knowing that there are better quality versions of those items, because the trade-off for me, for now, between cost and benefit is the right one. Bad product: good product, I might say.